The lacation was perfect and the facility of the hotel was very reasonable with good quality. I have enjoyed my stay. Thank you. I would prefer to have a reserved table in the restaurant and not have to change table many times during the stay. It’s always a pleasure to stay at Le Royal, with its magnificent views of the Baie des Anges and its 7 km of beaches. 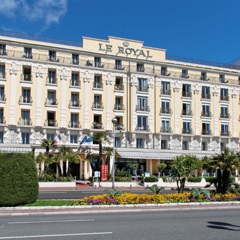 This remarkable building, the only 3-star hotel on the Promenade des Anglais, has retained all the charm of its former life as a palace, but with modern décor, flawless service, an excellent restaurant with friendly, lively dinners and an exciting programme of excursions available all year round. This former palace is ideally located on the Promenade des Anglais opposite the Baie des Anges. The sophisticated designer décor of its recently renovated rooms makes it a home-from-home you'll love to visit time and again. Good deal: Single room Essential, with simple comfort, city side. Make your stay unforgettable: opt for a sea view! Want more space: choose a Sperior room with sitting area. Le Royal is a large, fully air-conditioned 3-star hotel with 140 comfortable rooms, including 10 superior rooms, and 4 rooms for persons with reduced mobility. City-view and sea-view rooms are available. All the rooms are renovated for your greatest pleasure. Enjoy traditional cuisine with regional flavours in this Côte d’Azur hotel restaurant located on a terrace facing the sea. Meals are served in the 'Belle Epoque' restaurant, with its elegant ochre and white décor. The chef and his team prepare dishes full of wonderful Provençal flavours. Discover the recipe favorite of Ameur Salmi, Chef of the restaurant "Belle Epoque". A delicacy based on meringue, fruit and chocolate. This dessert "Dream of a child" is a delight! Breakfast 7.30 to 9.30 a.m. Lunch 12 to 1.30 p.m.
Dinner 7.15 to 8.45 p.m. There's nothing like sipping a delicious cocktail in the Hôtel Royal bar whilst admiring the sunset, after a day spent visiting museums and shops and strolling through the streets of Old Nice. The bar offers an extensive wine and cocktail list. You can enjoy your drinks either in the bar or on the sea-view terrace. Before, themed evening, shows, artists... During Elegance nights, dress up to the nines! Subdued atmosphere, Gala menu, musical accompaniment. The bar welcomes you in the dining room or on the terrace facing the sea. In front of the sea on the Promenade des Anglais, Le Royal *** offers a charming setting, ideal for the organization of themefor organizing theme evenings. Our hotel is the place of contemporary and traditional artistic meetings to make your stay in Nice memorable. Mr. and Mrs. Smile welcome you. These two huge sculptures with an original and humorous touch, were created by an artist from the south of France. These innovative and surprising smiles will make you spend a colourful and festive holiday. These creative open-air works are worth a look! At nightfall, the hotel becomes a palace of One Thousand and One Nights. The designer Gaspard Di Caro enhances the façade of the hotel with graphic and poetic images. An artistic and creative prowess inspired by an ancient technique "camera obscura", will dazzle your evenings. Take the time to enjoy our new wooded terrace for a magical moment on the Promenade des Anglais. From the One Man Show to the Boulevard Theater, the Royal's arts scene becomes the place of choice for entertainment. You will have a lot of laughs and good mood assured, your evenings at the hotel will not be the same. Shows for all tastes and unforgettable moments await you at the Royal! From September 14, 2017, live to the rhythm of dancing teas. In the afternoons at the hotel Le Royal, you will spend convivial moments. Illuminated corsos, parades, giant parades, flower battles, musicians and dancers from all over the world ... 2018 will play on the tradition and modernity of Nice. Day and night, live to the rhythm of the carnival! PROMO: 2 events are included in the price of the 2 stays of 7 nights from 16/02 to 02/03/18, 1 event is included in the stay of 8 nights from 02/03 to 10/03/18. Opportunity to buy on-site events. Bollywood, a name that sings the joy of living! Monumental motifs, colorful flower beds, dances, songs ... evoking Indian mythology. Whether you’re here with your family, as a couple or with friends, and whatever type of holiday you would like, the wide range of activities available on the Côte d’Azur offer everything you need for the perfect weekend or holiday in Nice. Enjoy beach games and water sports, hiking inland, visiting the picturesque villages and towns along the Côte and relaxing in your 3-star hotel! May: the May festival celebrates the revival of nature with folklore shows, introductions to games and typical dishes. July: Nice Jazz Festival which hosts prestigious musicians at concerts at the Théâtre de Verdure, a 5-minute walk from the hotel. On the occasion of the Prom'party, several scenes are installed along the Promenade des Anglais throughout the summer. San Bertoumieu celebrates local products, the Jeux de la Francophonie, a crossroads of sports and cultural exchanges between French-speaking countries. The hotel's Kiosque will provide information on excursions and current events during your stay in Nice; it also offers a ticketing service for museums, parks, shows and excursions. Walk along the beach and imagine you’re in the early 19th century. In those days, it was called the 'Chemin des Anglais' and was a small muddy path lined with villas and gardens. In the early 20th century, palaces, hotels, casinos and residential buildings slowly began to replace the previous small dwellings. Le Royal is at the heart of this magnificent location, so spend some time admiring the majestic façades and the view of the splendid beach and the Baie des Anges. Parks and gardens: Jardin Albert 1er, Jardin des Arènes de Cimiez, Parc Phœnix botanic gardens. Walks: the Promenade des Anglais, the Place Masséna, the Cours Saleya, Old Nice, the port, etc. Enjoy one or more excursions during your stay in Nice and discover the region and its main attractions. Our full-day and half-day excursions are prepared and accompanied by qualified guides, with an agent in Nice available for tailor-made tours. Full-day excursions include admissions, lunches and drinks; several hotels are grouped together for guaranteed departures with a minimum of 12 people. Check the reception of the Royal at your arrival to know the program, or contact us now for any information and pre-registration with our Excursions Côte d'Azur service: sdelteil@vacancesbleues.fr. Golf Country Club Nice (20 km): initiation, development, driving range and golf nine holes. Le Royal does not have a car park, but you can pay to use the car park near the hotel (booking not possible, approximately € 30/day and € 100/week). The Royal does not organise transfers on arrival, but on departure you can request a transfer to the SNCF station or airport depending on the number of people (fee payable). Nice Côte d’Azur Airport 4 km from Le Royal. Nice station 1 km from the hotel. Check-in: Saturdays from 3 p.m.
Check-out: Saturdays before 10 a.m. Tourist tax, collected on behalf of the municipal authorities and payable on booking. The amount is calculated per person per night and is likely to be reviewed during the year. Car park near the hotel (payable, booking not possible, approximately €23/day and €100/week). Our staff is aware of how to welcome customers with disabilities. Also discover our other hotels in the region if you are planning a holiday in Cannes during the festival or a visit to Menton during the Lemon Festival. Vacances Bleues has hotels in exceptional locations! HALF-BOARD PACKAGE: Accommodation per night on a half-board basis (breakfast and dinner). Options: Full board: from 18 to 21 € / night depending on the season - Animals allowed:14€/night (to be mentioned when booking). Full board includes dinner from the 1st day to breakfast on the day of departure. Nice Carnival: 2 events are included in the price of the 2 stays of 7 nights from 16/02 to 02/03/18, 1 event is included in the stay of 8 nights from 02/03 to 10/03/18. Opportunity to buy on-site events. -20% on adult price for children from 2 to 11. This advantage also applies to single-parent families. The Royal Westminster seduces with its refined comfort. This charming hotel has an exotic garden and an exceptional location, close to the Jean Cocteau Museum. On the "Promenade du Soleil de Menton"
Italian-style holidays at Balmoral, a charming hotel located facing the beach of Menton. Sightseeing tours to Italy and the picturesque villages of the region are organised from the hotel.